KANSAS CITY, Kan. — One hundred years ago on Dec. 1, a group of marauding desert bandits dragged a priest/hermit out of his simple hut, assaulted him, bound him with ropes and threw him in a ditch. The priest lay in the ditch all day, praying in preparation for what might come. His attackers were from the Senoussi tribe, which resisted the French colonial rule of their Algerian homeland. The bandits, who intended to kidnap the priest, were surprised by the arrival of two French soldiers. The bandits shot the two solders and the priest. That priest — Blessed Charles de Foucauld — might have been forgotten as time passed. Although respected as a holy man by the nearby Tuareg tribe in the town of Tamenghest, he had not made a single convert in 10 years of living in that region. And he never saw the realization of his dream — sharing his vocation of being “a universal brother” with a fraternity of brothers. But mysteriously, God moved many persons to be inspired by Blessed Charles and to form associations, religious communities and secular institutes for laypeople and priests. Today, one of those entities is the Jesus Caritas Fraternity of Priests. Approximately 4,500 priests around the world are members of small groups called fraternities. There are nine fraternities, consisting of five to seven priests each, in the Archdiocese of Kansas City in Kansas. In addition to meeting as fraternities on a monthly basis, members of Jesus Caritas have a worldwide General Assembly that meets every six years, and an International Council that meets annually in different countries. 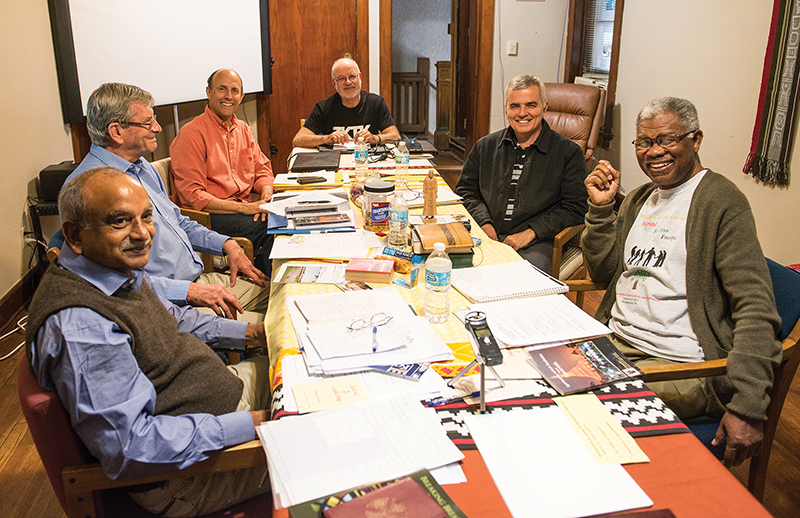 This year, the six-member International Council met from Oct. 17-27 at the Sanctuary of Hope Prayer and Retreat Center in Kansas City, Kansas. The host was North American representative Father Mark Mertes, pastor of Blessed Sacrament, Our Lady & St. Rose, and Christ the King parishes in Kansas City, Kansas. Visiting representatives included Father Rajaonarivelo Felix from Madagascar (Africa); Father Mauricio Da Silva Jardim from Brazil (Latin America); Father Aurelio Sanz from Spain (chairman); Father Jean-Francois Berjonneau from France (Europe); and Father Emmanuel Asi from Pakistan (Asia). Additionally, the fraternities meet once a month. During the International Council’s meeting, members had opportunities to do many things together: pray, eat, celebrate Mass, visit parishes, visit religious orders and groups in the archdiocese, and even get in a little sightseeing. The council members also talked about topics that dealt with the practical and spiritual circumstances of their fraternity brothers and those they serve. The discussions were held in three languages common to the six: English, French and Spanish. Sometimes, all three at once. International Council members also plan and encourage “continental” assemblies for the fraternities in each continent and participation in the coming General Assembly. The last worldwide General Assembly was in November 2012 at Poissey, France. The next one will be held January 2019 in Bangalore, India. A new international responsible will be elected at the Bangalore assembly.